Mannequins are the most commonplace and spread manner of displaying various items of jewelry. They come in multiple shapes, diverse sizes and they offer a rather large range of display so that each type of jewelry can be beautifully and efficiently presented to any customer. Depending on their size, they will be easily accommodated everywhere around the store, on vanity, dressing tables, in window display cases or any other kind of show cases. Their design and style vary from retro and vintage looking to modern, futuristic, dainty or any other kind of design. The most customary colors are black, white, and gray or silver. 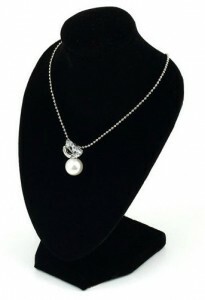 They represent elegant and stylish ways of exhibiting items of jewelry and they also are space-saving. In addition to that, they can be just as well utilized as innovative and interesting pieces of decoration for a more unconventional and attractive look. Mannequins are undoubtedly a must-have in any jewelry store; they organize, store and display every type of jewelry item. Their target is to present pieces of jewelry in a beautiful, attractive, useful and fashionable way, to provide the perfect display of your products and to offer an accurate and just look at the way the jewelry is supposed to be worn. There are full body types of mannequins, half body or diverse body parts intended for a fixed use. They are able to display anything from head jewelry (tiaras, headdresses) to foot jewelry (ankle bracelets, toe rings) in a gorgeous and chic manner. Their appearance goes from flimsy and delicate designs to innovative, unconventional and trendy looks. Each kind of jewelry display mannequin is meant to help you exhibit jewelry with grace, style and efficiency. Decorating your store with mannequins is going to prove to be a very helpful and also attractive move and you will undoubtedly appreciate the way your items are displayed. Mannequin heads and half heads are the best way to exhibit the use of certain items of jewelry, such as pairs of earrings, tiaras, necklaces. This kind of mannequin is very easy to accommodate in any jewelry store’s window display or amongst other jewelry display items. Given their size, they can be very convenient and space-saving. They can be placed anywhere around the store or they can be used at home just as well. They are both fit for displaying pieces of jewelry or simply as items of decorations. This kind of jewelry display is ideal for any modern art interior decoration. Mannequin heads and half heads are usually neutral colors, most commonly either black, white, dark gray or silver so they can easily blend in with any type of environment. They are elegant and chic, ideal for displaying items of head jewelry and they are sure to attract anyone’s attention. Mannequin busts are the kind of jewelry display that offer a certain gravity and unique kind of finesse and elegance wherever they are situated. They are a fine and stylish way of displaying items of jewelry with grace and good taste. Busts are ideally destined to exhibit jewelry like tiaras, headdresses, necklaces and so on. They are perfect as the main objective of any jewelry exhibition set and they offer a beautiful and one of a kind decoration that is fit for both professional and personal use. Busts are the perfect way to present your items of jewelry if you want to have them gorgeously displayed before anyone else just like in an art gallery. They are chic, elegant and are sure to catch anyone’s eye as they are going to stand out in any environment. 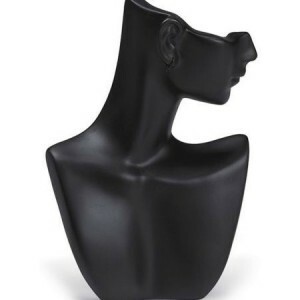 Mannequin busts are definitely the best way to beautifully present head jewelry to any customer. Mannequin hands and arms are meant for the display of jewelry items such as arm bracelets, bracelets, rings. They are the perfect way to display hand jewelry in an elegant and delicate manner. Mannequin hands and arms are very convenient and useful when decorating a jewelry store or for your own personal use at home. They are usually small sized, therefore making them very space-saving when displaying your items of jewelry. They are usually small sized, therefore making them very space-saving when displaying your items of jewelry. They can easily fit in any window display, on every desk, table, vanity and so on. This type of mannequin display is very graceful and they will definitely shed a new kind of elegance everywhere they are placed. These types of mannequins offer a simple and efficient way of displaying items of jewelry in an organized manner and they help to prevent their getting tangled into each other. Mannequin hands and arms are ideal for being used in any specialized jewelry store or at home. Mannequin feet are usually ankle-high mannequin pieces. They are ideal for the display of ankle bracelets or toe rings. They’re very handy when displaying jewelry in a window case as they are very stable and they will present your items of jewelry in a safe manner. They can be part of entire jewelry exhibition sets or they can display jewelry on their own. They come in more sizes but they don’t usually take up much space so they can be placed everywhere around the store without being an inconvenience. Mannequin feet offer a great and efficient way of organizing and keeping track of items of foot jewelry. They are also an innovative and modern piece of decoration, so they’re perfect for anyone looking to decorate or display their items of jewelry in more special and one of a kind way. Mannequin feet are efficient, useful, elegant and great at displaying foot jewelry. Mannequin stands represent the perfect combination between efficient storing and an elegant display of jewelry items. 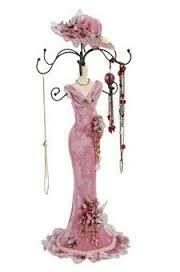 Mannequin stands offer a safe and stable display of jewelry as they are very well supported. They come in multiple shapes and sizes so as to provide a wider range of jewelry exhibition and they are usually either black, gray or white. They provide a unique and stylish kind of grace when presenting various items of jewerly. Moreover, they are perfectly suitable as items of decoration as well, since they offer a modern art kind of vibe to any environment. Mannequin stands are convenient, useful and they don’t take up much space so they provide a great way of saving up space. They are great for exhibition sets ideas or for the display of jewelry throughout the store or at home and they will surely attract everyone’s attention due to their beautiful and fancy design. Mannequin heads and shoulders are mainly intended for the display of head jewelry, such as tiaras, pairs of earrings, and for necklaces as well. This kind of jewelry display is very elegant and attractive and it is surely going to catch anyone’s eye! They offer a special kind of grace and style and they are also perfect as items of decoration. They are elegant and chic and a neat idea for decorating your jewelry store or home as well. Mannequin heads are an ideal way of displaying items of jewelry in the jewelry window case as they have a unique and special kind of imposing and they will definitely be very much admired by any passer-by! Moreover, given their size, they are also easy to store and they will keep your necklaces, earrings and other items of jewelry neatly organized, so they will prove to be very useful as well. Mini mannequin dress forms such as half body, full body and arms offer a wider range of jewelry display and they are very useful and organizing and safely storing items of jewelry. They can easily accommodate and display necklaces, belts, arm bracelets, wrist bracelets, rings and many others. They are ideal for the display of jewelry in window cases as they can offer a very beautiful and stylish exhibition of your items of jewelry. They can just as well be placed on any vanity, dressing table, desk to create a more trendy and elegant environment. This kind of mannequin offer a fashionable and classy manner of displaying jewelry and they will definitely be very attractive to any customer! They are beautiful and chic and they also can be used as a very interesting and innovative way of decorating your home or jewelry store while displaying jewelry at the same time! 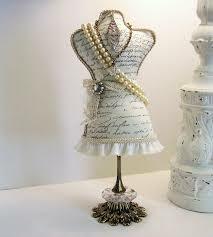 Miniature mannequins are a beautiful, lovely and dainty way of displaying items of jewelry. They offer a special kind of grace and style and they are the perfect way of decorating your jewelry store. They are usually small sized and they come in multiple designs and they mainly feature full or half body shapes. They are definitely very elegant and they are certain to attract everyone’s attention. Given their miniature sizes, they can be readily utilized and accommodated in any jewelry exhibition set or window store. They are delicate and exquisite, ideal for the display of various items of jewelry, such as bracelets, rings, pairs of earrings. They are usually equipped with hooks and they are available in a myriad of colors. They can be used as items of interior decoration just as well, considering their beautiful and attractive look and they are surely going to be very much admired. Mini mannequin jewelry tree strands are a gorgeous and special way of displaying jewelry. They have a slender and chic body and they usually are shaped like stylishly dressed lady miniatures. They offer a wide range of designs and they are all beautifully adorned, with the minutest attention to each detail. They are a true token of great taste and style and they are going to display various items of jewelry in a truly unique and fashionable manner. They are equipped with hooks where you can easily hang jewelry such as pairs of earrings, rings, bracelets, brooches, necklaces and many others. They are ideal for the display of jewelry in any jewelry store and window display case. Furthermore, they are also a lovely and exquisite piece of interior decoration, so if you’re looking for innovative and one of a kind decoration, mini mannequin jewelry tree stands are the perfect thing! 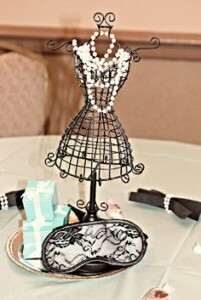 Table top mannequins are undoubtedly one of the most amazing and fashionable ways of displaying items of jewelry. They are gorgeously designed with a great attention to every detail; they offer lovely and beautiful designs and colors. They feature a full body mannequin that is supported on a metal stand. The mannequin body usually presents an attractive and unique dress pattern, therefore making each table top mannequin the perfect way of exhibiting jewelry in a more one of a kind manner. They do not take up much space, so they are ideal for the display of jewelry everywhere, jewelry stores’ window, on vanities, dressing tables and so on. Obviously, they are just as perfect for decorating interior environments. They offer a chic and stylish manner of jewelry presentation and they are definitely sure to stand out anywhere you place them. They are most suitable for smaller jewelry, such as rings, bracelets, earrings. Small wire mannequins are by far a most unique and interesting way of jewelry display. They are made of carefully arranged sets of wire and they make up a beautiful and enticing mannequin body. They present a graceful and delicate yet strong and sturdy looking manner of exhibiting items of jewelry. Their most common color is black. They are a true token of elegance and care even to the smallest detail. They are usually small sized, therefore very space-efficient. They can be either used in jewelry exhibition sets on window cases or you can choose to decorate the jewelry store using this wonderful and fabulous item of display. They are ideal if you’re trying to attract more attention to the earrings, brooches, bracelets, rings you want to have admired and it is definitely going to prove to be a very enticing and unique jewelry display method to any passerby or customer! Torso mannequins refer to mannequins that feature the neck towards the lower body. Those come in many sizes, skin colors and shapes and they are perfect as the main display of jewelry in a window store. They are both suited for jewelry and garment display. They offer a stable and safe display of jewelry items as they are also supported on a strong metal stand. They are a usual yet elegant manner of displaying various items of jewelry. Torso mannequins are perfect for the display of belts, necklaces and so on. In addition to that, they can be just as well used as items of modern decoration as they will surely embellish any environment with their innovative and interesting design. They come in plenty of colors, but most commonly black or white. Torso mannequins are also a very efficient way of display the right and intended use and wear of your items of jewelry. Black mannequins are by far the best and most universal symbol of jewelry and clothing display. Black is a very elegant and stylish color and black mannequins are ideal for the display of items of jewelry. Given their neutral color, they are also most suitable for any kind of design. Be it retro, modern, futuristic, abstract or colorful, black mannequins are sure to always fit in the background. They are great as mere items of decoration as well, if you’re looking to spice up your interior design by adding mannequins for a more classy and fashionable environment. This kind of mannequins are definitely going to attract anyone’s attention. They can be either full body, half body, a torso and so on. Depending on that, their size will vary as well but they are usually very space-saving so they will help you display jewelry in a very efficient way as well. White mannequins offer a special and exquisite kind of gracefulness and elegance wherever they are placed. Their white color sheds an immaculate and pure light upon each item of jewelry they are displaying and their surroundings. Just like black mannequins, they can appear in various and diverse shapes, sizes and models. They are designed to store all kinds of jewelry, bracelets, necklaces, headdresses, belts, foot jewelry and so on. White mannequins are ideal if you would like to have a certain allure of innocence and grace around your jewelry and store. Their light color is sure to make them stand out in any jewelry exhibition set. White is the perfect color if you’re looking for ways of decorating your store in either a vintage manner or a simplistic and minimalistic modern way. Either way, white mannequins are going to be a great addition and they will certainly be admired by all customers! Silver/ gray mannequins are also an elegant method of display your jewelry products. They come in various shades of silver/ gray, from dark to light hues. They are available in many sizes and body types as well so they are able to display a wider range of jewelry items. Silver is a very fancy and chic color so it will make your pieces of jewelry look even more sophisticated. Given that they come in various body types, any kind of jewelry can be displayed, from rings and head jewelry to bracelets, belts and foot jewelry. Silver or gray mannequins are a lovely and attractive addition to any jewelry store, they can be used in plenty of jewelry exhibitions and they will definitely prove to be very striking to any customer. You can place them in any window display or have them dispersed them around the store for a better look at your jewelry. Chrome Mannequins are definitely the fanciest and most fabulous kind of display mannequins there is. They are shiny and glossy and they will undoubtedly be admired by every customer who catches a glimpse. They are remarkable and very chic, so they will completely innovate the way you display your items of jewelry. If you’re looking for a more outstanding and unconventional manner of having your products presented, chrome mannequins are the best way to do it. Thanks to their glossy look and highly attractive design, they are more than ideal for being displayed in the window case of your jewelry store. In addition, if you’re looking for a more steampunk look for your store, chrome mannequins are also the perfect choice. Their marvellous and groovy color, polished aspect and enticing display makes for a really stylish and splendid design that will surely enhance the look of your jewelry as well. Gold mannequins are a genuine and remarkable display of luxury and lushiousness. They offer a very rich and opulent look and they will stand out everywhere you place them. Their gold color will beautifully contract with any item of jewelry that you intend to have displayed and their luxuriant design will surely shed a gorgeous and attractive light upon your jewelry items. Just like the other types of mannequins, gold mannequins come in plenty of shapes and sizes as well. They are able to display diverse kinds of jewelry, such as earrigs, bracelets, necklaces and so on. If you’re looking for ways of embellishing your jewelry store, using gold mannequins is surely the way to go! They will offer a special kind of grace, opulence and sumptuousness to your interior decoration while displaying your jewelry at the same time; they are gorgeous and shiny and they will be noticed by everyone without a doubt!